Provide comfort for the family of Jimmy Winters with a meaningful gesture of sympathy. Jimmy Winters, 60, passed away, Monday, January 28, 2019 in Fort Worth. Jimmy was born February 19, 1958 in Fort Worth to Robert and Myrtle (Johnson) Winters. The both preceded him in death along with his brother, Steve Winters and sister, Diane Gustafson. He is survived by his wife, Tammy (McDowell) Winters; sons, Daniel and David Winters; sisters, Barbara Colvard, Sandra Scott and Delois Hall; granddaughter, Macie Winters and grandson, Roman Winters; several nieces, nephews and extended family and friends. To send flowers in memory of Jimmy Dale Winters, please visit our Heartfelt Sympathies Store. 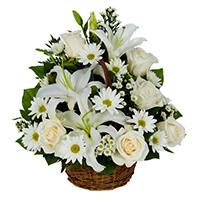 All Flowers need to be delivered to the church Saturday. Donna and Delana Blaylock sent flowers to the family of Jimmy Dale Winters. I am so sorry for your loss. My thoughts and prays are with you and your family. Donna and Delana Blaylock purchased the THINKING OF YOU BASKET for the family of Jimmy Winters. My condolences to the Winters family during this difficult time. In the Bible, Jehovah God gives us hope. Acts 24:15 says, “there is going to be a resurrection of both the righteous and the unrighteous.” Revelation 21:4 says, “and he will wipe out every tear from their eyes and death will be no more.” Very soon we will see the fulfillment of these promises here on Earth. We hope you find comfort in God’s promises.